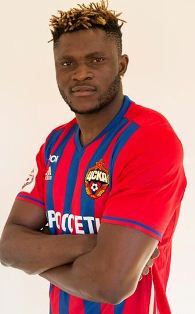 CSKA Moscow striker Aaron Samuel has declared that Barcelona are his favourite club, and was pleased that the La Liga champions qualified for the Champions League quarterfinals after a memorable game versus PSG. The Nigeria international has named Manchester United star Zlatan Ibrahimovic as his favourite player. “My favorite football player is Zlatan Ibrahimovic, and my favorite team is Barcelona, ” Samuel told cskainfo.com. “The game between Barcelona and PSG was incredible. It’s very cool to comeback from four goals down and win 6: 1. In his second spell with CSKA Moscow, Samuel has played three games for the side in the Russian Premier League.